On Season hours generally from May to December. Off Season hours generally from January to April. Old Market: Omaha's unique Arts & Entertainment district. Sundries: items too numerous to list. 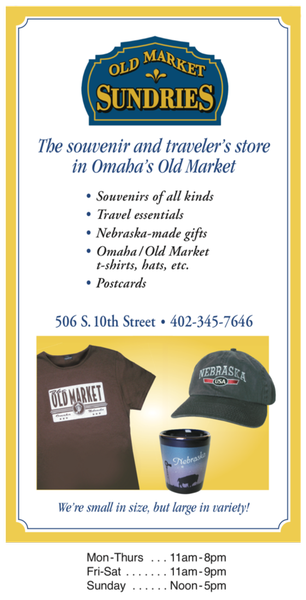 Stop by to see our souvenirs, Nebraska-made gifts, travel essentials, Heartland apparel, and Husker items. Ask for a free gift with your $10 purchase. Major credit cards accepted. We are co-located with Tannenbaum Christmas Shop. If our 10th Street entrance is closed, enter around the corner at Tannenbaum, 1007 Howard St.
On 10th Street, 4 blocks south of US Hwy 6 (Dodge St. going west; Douglas St. going east), across the street from Embassy Suites Hotel.